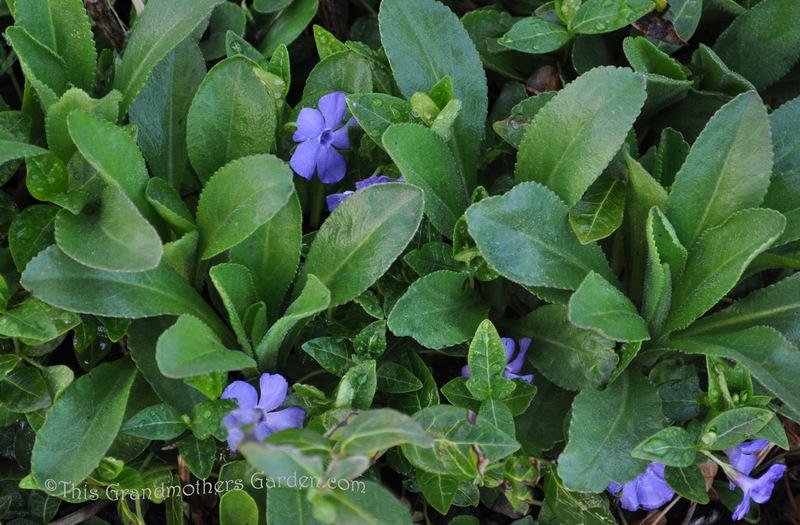 This Grandmother's Garden: Our SPRING has Sprung! These dainty little blossoms are a first in my garden. I planted 100 of the tiny bulbs in a container last Fall. They are just beginning to bloom. These blossoms are always a welcome sight... fresh sweet strawberries will be here soon! 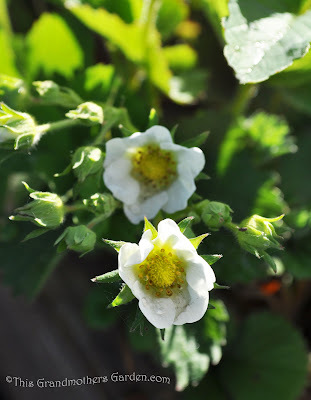 These strawberries are everbearing, but the largest crop is always in Spring. Chocolate Chip isn't nearly as invasive. All the Redbuds are in their splendor! Eastern, Forest Pansy and Oklahoma are in full bloom. Incidentally, they are blooming here about four weeks later than last year. Just beginning to peak out from their foliage. These are planted with Shasta Daisies that won't be blooming for a while yet. Burkwood Viburnums have finally popped! And oh my! Their sweet fragrance fills the air with its heavenly smell. These crimson blossoms grow on a lush carpet of green but they only bloom in Springtime. Another reason why I love Spring! These trees dot my neighborhood, planted by the city in our open green spaces. 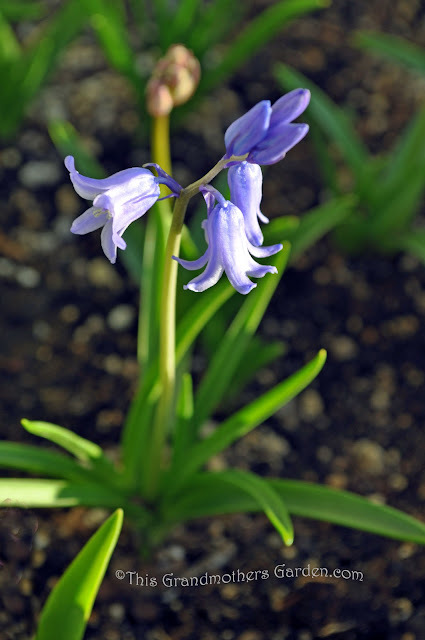 Their flowers are profuse and fragrant in Spring. As Summer approaches, their green leaves will turn to deep burgundy. So glad that Spring has finally Sprung here! but we're so thankful for the joys that come from gardening. for all the beautiful creations we are blessed to nurture in our gardens. 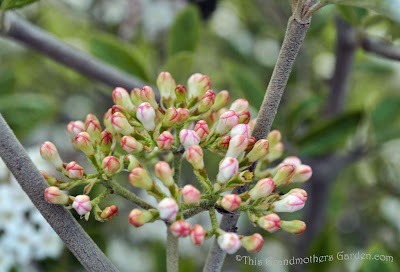 Carolyn what gorgeous blooms are showing up now in your spring garden. It is always such a joy when things start blooming again. 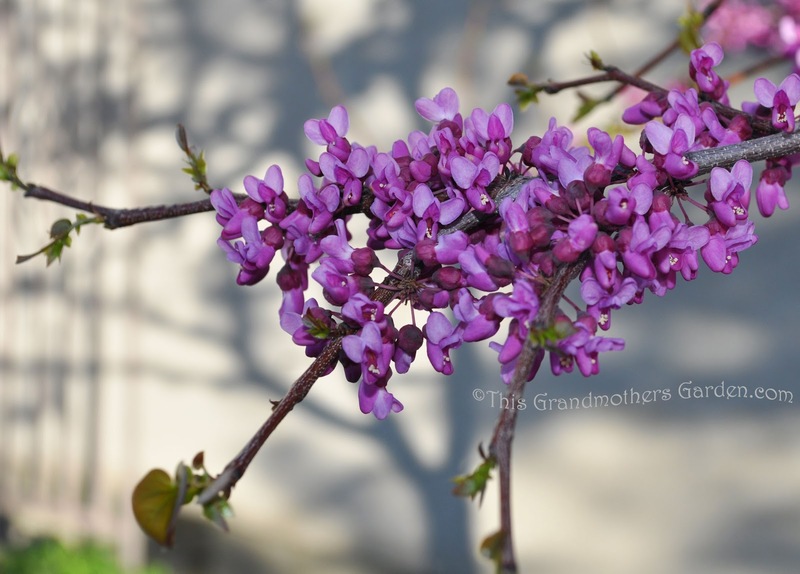 The Viburnums blooms are so pretty and I love Redbud tree blooms. Have a wonderful day. Those blooms are wonderful. 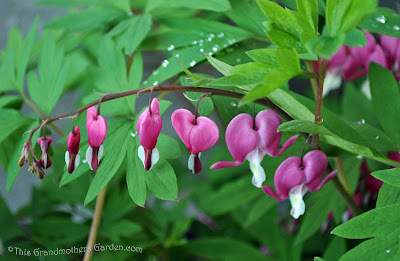 I have to remember to grow bleeding hearts!! Spring is indeed visiting you in all her glory! Lovely samples! I imagine it smells heavenly, too. Happy GBBD! What pretty flowers you have for us today, I could almost smell the spring fragrances! Happy spring to you! I have always loved Bleeding hearts. 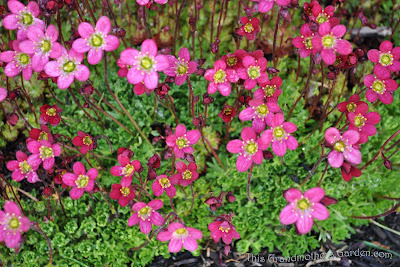 They are such beautiful Perennials. 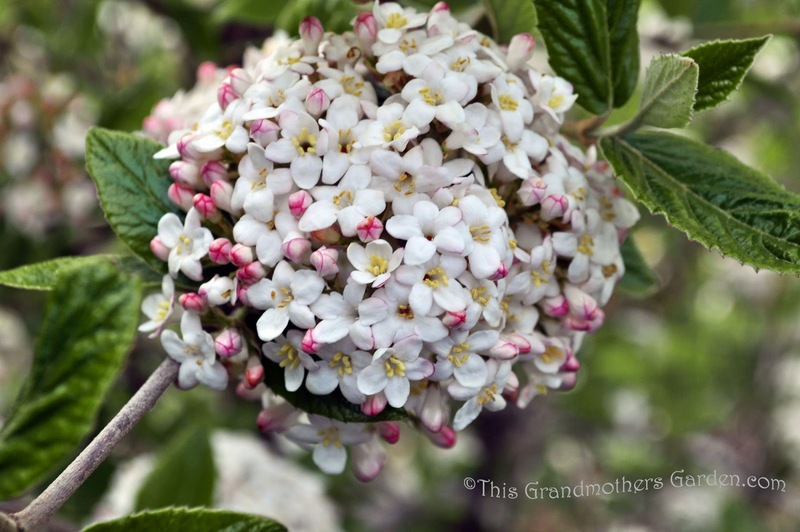 Your Viburnums are lovely as well. 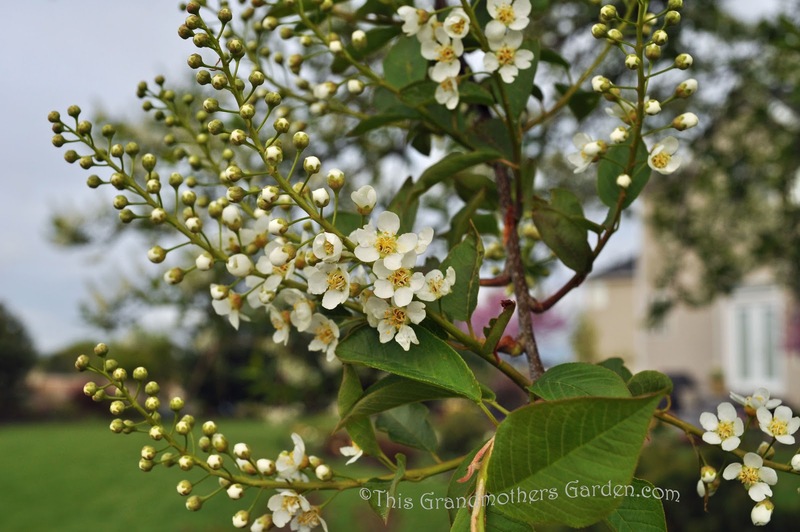 Isn't is interesting how flowering shrubs add so much to our landscape? I bet you get some amazing butterflies in your garden during the warm months! Happy GBBD Carolyn. Your dancing hearts are pretty, I have to remember that description. So much beauty has graced your garden in May, I hope your weather is good as well. Seems like your blooms are quite happy. Redbuds are one of my favorite trees. They signal spring in NM, too. Isn't spring so exciting? 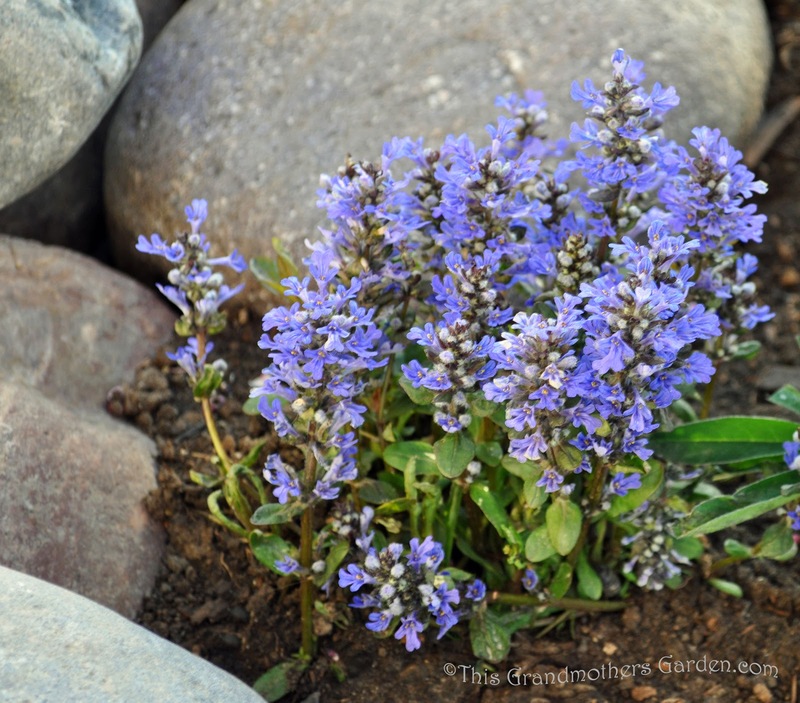 With the emergence of new life each day, these simple joys from my garden bring me happiness! Your flowers are so delicate and colorful. I love them. Your Chocolate Chip Ajuga is really full of blooms - hope mine looks like that some day. And that Rockfoil is spectacular. Happy GBBD! I'm so glad that spring finally arrived in your garden! And boy is it beautiful!